Length 9 km (5.6 miles), terrain is fairly flat (56 meter gain), but elevation is high: 1600 meters (5300 feet)! NOTE: Denver is not as high as most towns in the Colorado Rockies further west, but it is still a mile high (1600 meters), so make sure you take a couple of days to adjust to the altitude before attempting any running! Here's a route that takes you through the quiet, greener side of Denver, which can be found right next to downtown. It winds through the leafy neighborhoods and parks just east of downtown, winding through Cheesman Park and City Park before heading back. 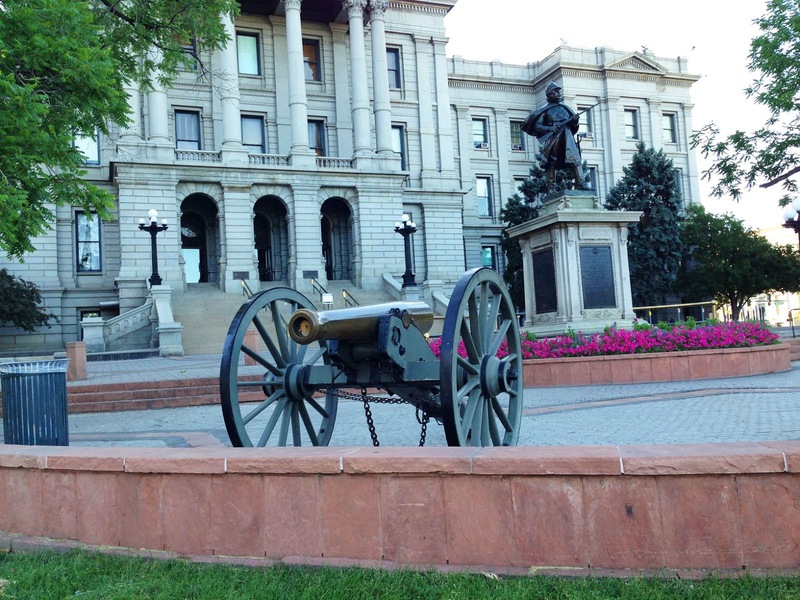 We will start right in front of the Colorado State Capitol building at Colfax and Lincoln Street. 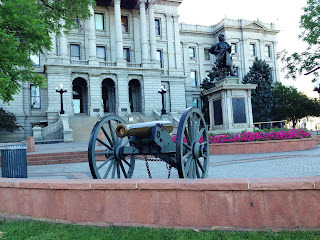 If you are staying in a downtown hotel, you can easily get there by taking the free 16th Street Mall shuttle bus, which ends just two blocks west of the capitol. Standing there in front of the capitol building, facing the Civil War Veterans Memorial, turn right and run eastwards along E 14th Avenue. 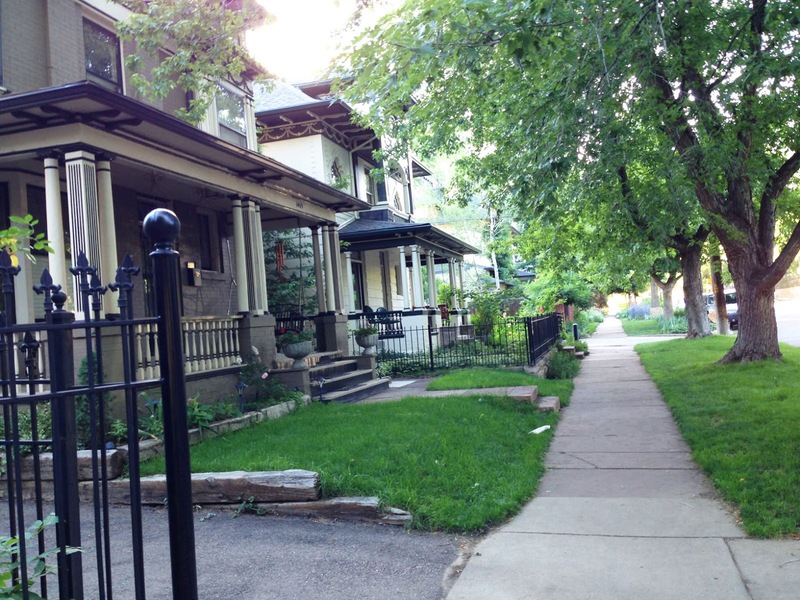 This is a fairly busy street though, and we want to take some quiet, residential streets. So, after just a few blocks, turn right onto Logan Street. 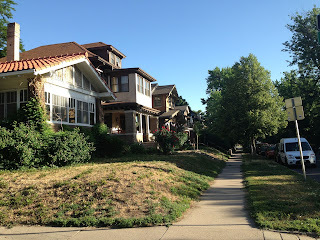 Run south on Logan for two blocks and then turn left onto E 12th Ave. Now continue running eastwards through this very pleasant neighborhood. You will be running lightly uphill. 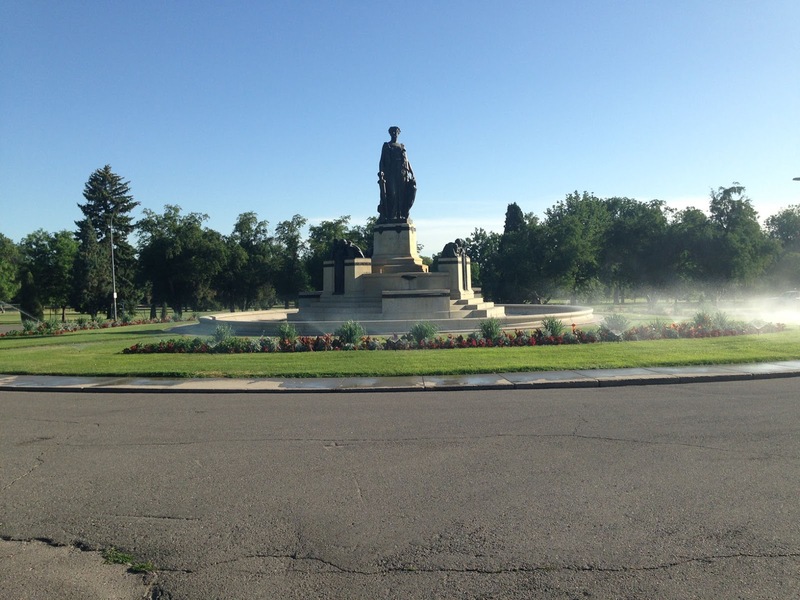 After about 12 blocks, the street ends when it runs into Cheesman Park. Continue into the park on the sidewalk, following the first turn to the right. This sidewalk then curves to the left and comes to E 11th Avenue, which bisects the park. NOTE: the Denver Botanical Gardens is located in Cheesman Park just south of here, and is well worth a visit sometime (there is an entrance fee)! 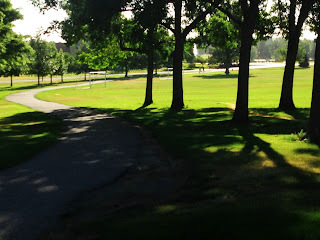 Follow this sidewalk to the right in Cheesman Park! Follow E 11th Avenue east. At Josephine Street, 11th Ave. continues again a few meters to the left, where you keep running east. 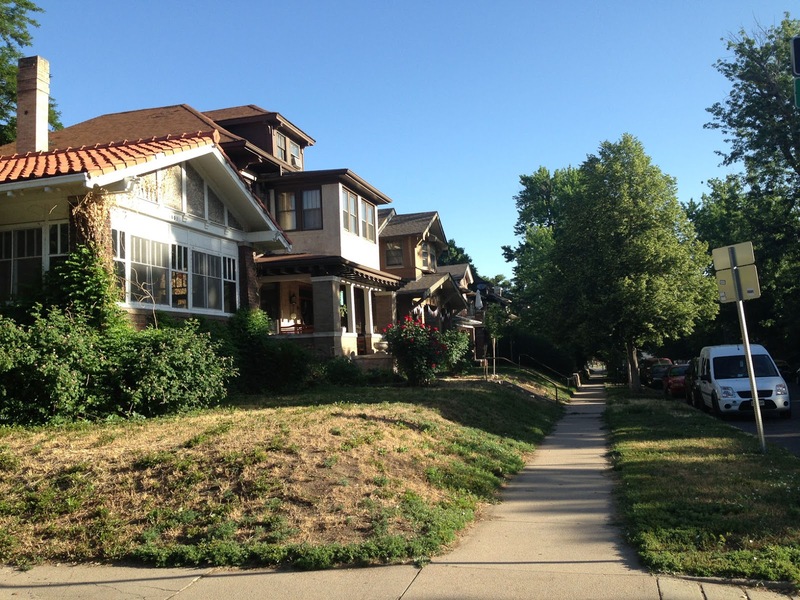 Just one block later, at Columbine Street, turn left to run north through more nice neighborhoods. You'll notice that you are now running slightly downhill, doing wonders for your spirit and your speed. 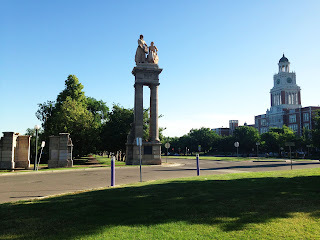 When you cross Colfax, you'll come to a big column and a parkway (City Park Esplanade) leading past the imposing East High School building on the right side. You'll pass the school athletic field on the left side. Past the next cross-street, E 17th Avenue, the biggest park, City Park, begins. Run to the fountain near the entrance, then turn right to follow the street, then the sidewalk as it leads east to Ferril Lake. Turn left after the pavilion to run north, along the lake, past the parking lot. After the parking lot, turn left onto the next sidewalk to head northwest to the duck pond. Follow the south shore of the duck pond, then turn north along the park road to make a small loop. 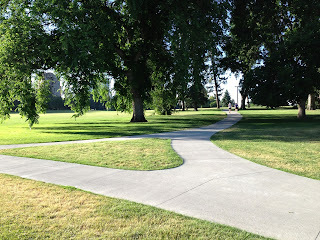 It then turns southwards and heads back to Thatcher Fountain and the spot where you entered the park before. NOTE: You could do a much bigger loop of the park, but I tried to keep the mileage down there. Now run south along the Esplanade, retracing your steps to E 16th Ave., where you turn right and start heading west through more pleasant homes. After 2.5 km, when you come to Lincoln Street, turn left to run the one block back to the capitol building.